Hello, I'm Sarah Mortimer and I'm a Clinical Hypnotherapist. This page is here solely for the purpose of you getting to know me a little better, giving you some idea of whether I would be a good fit for you as a hypnotherapist. If you like what you read and you would like to work with me, please feel free to get in touch. Nearly a decade ago I suffered with chronic pain. I experienced pain in my lower back and sciatica down my legs on a daily basis. It was very debilitating, impacting on all areas of my life. Living with chronic pain daily is very draining and I found myself developing depression and anxiety as a result which made the pain even worse. After seeing numerous doctors and consultants, I was referred to an NHS-led pain management programme. The programme covered a wide number of things and I learnt about the modern theories of pain, relaxation techniques, mindfulness and guided visualisation, exercise routines, how to pace myself, problem solving to help with stresses and worries, how to be assertive and put myself first, how to get better sleep, and how to be more in control of my thoughts. It was invaluable and it made me realise that the way I was dealing with the pain was making it worse and that there were many things that I could in fact do to help improve and manage it. I felt empowered and hopeful for the first time since the pain started. It was a real turning point for me. My own personal experience coupled with my in depth training has made me realise how essential it is to feel empowered when it comes to making changes. To empower someone is to give them the authority or power to do something. It is vital and at the very heart of successful therapy. Because I gained so much from the programme, in particular the relaxation, mindfulness and guided visualisation, I decided to see a hypnotherapist in Bristol to continue where the NHS programme left off to help me manage my pain even better. I was fascinated by it and after just two sessions I decided to enrol on a hypnotherapy practitioner diploma. I had previously thought I was doomed to be in pain for the rest of my life but I can happily say that by applying what I learnt on the pain management program, from the hypnotherapist I went to see, and the diploma I studied and subsequently completed, that I no longer suffer with chronic pain in my back any more! Hypnosis never ceases to amaze me. In fact, I think it’s awesome! Hypnosis first started being used back in the late 1800s primarily by surgeons performing operations using hypnosis as an anesthetic. It is still used in some hospitals in this way today. You can see why I think it’s amazing! Hypnotherapy is a vast field and as someone who is passionate about learning, this pleases me. It means there will always be something new to discover, courses to attend and books to read to satisfy my thirst for knowledge and my curiosity. I have worked with people to help them manage their stress and anxiety for over a decade now, and more specifically with hypnosis since 2010. I have trained in a number of different approaches to hypnosis over the years which has given me a really good understanding of the field and has enabled me to choose the approach that most fits me and my clients. I work to an evidence-based cognitive behavioural model and as such I use techniques that have been significantly researched by scientists and found to be effective. I am now one of Bristol's senior clinicians, having had thousands of hours in clinical practice. I have appeared on BBC Radio Bristol a couple of times talking about various issues that can be helped with hypnotherapy. You can read more about these on the In the media page. I see clients for hypnotherapy at The Harbourside Practice in Redcliffe, Bristol. It’s situated in a great location as it’s easy to get to from the city centre and for those who come to Bristol by train specifically to see me. I also offer online sessions via Skype or Zoom for those who are not able to make it to the clinic. In addition to seeing clients for hypnotherapy, I am also a classroom assistant on the Hypnotherapy Practitioner Diploma run by The Anglo European College of Therapeutic Hypnosis in Bournemouth. My role as a classroom assistant, along with the other assistants, is to assist and support the college principal, Adam Eason, and the students on the course. I am a qualified supervisor and offer one-to-one supervision sessions to hypnotherapists via Skype or Zoom, helping them to develop as a hypnotherapist and support them in their practice so that their clients receive the very best care. I am Research & Supervision Officer at the Professional Hypnotherapy Network. My role it to help build awareness and understanding of hypnosis research available to members through the International Journal of Clinical & Experimental Hypnosis to inform their practice. I also advise members about supervision and ensure they meet membership requirements, in addition to leading and supporting PHN supervisors and those wishing to train to be supervisors or set up peer support groups. I am also part of a team of people who organise and run the annual UK Hypnosis Convention. When I’m not seeing clients or working on my hypnotherapy business, the vast majority of my free time is taken up on my narrowboat. I find it so peaceful being around water. I enjoy spending as much time outside in nature as I can. One of my favourite things is going for walks and exploring the neighbouring villages and countryside that we visit on our boat. I love nothing better (other than hypnotherapy of course) than sitting outside on the towpath watching the world go by, observing the shenanigans of other boaters, and on the lookout for a glimpse of the elusive water voles, kingfishers and otters so I can tick them off in my British wildlife book. Over the years, I have seen people for a wide variety of issues. However, I probably have seen people with anxiety related issues the most, so as you’d expect I now have a lot of experience in these areas. Seeing a lot of anxious people with specific and general anxiety, panic attacks and phobias, influenced my training and development so I am now well equipped with the latest evidence based techniques to use with people. The fact that I’ve helped a lot of people with anxiety isn’t the only reason I specialise in this area. I myself have experienced anxiety and phobias at various points of my life especially when I was at university and had persistent pain. I particularly have an interest in medical and dental related phobias as these were the areas that I once struggled with. Read about how hypnotherapy allowed me to donate blood. I used to have a needle phobia, but they no longer cause me any problem thanks to hypnosis. This is evidenced in the picture on the right which shows a surgical needle that was put through my hand whilst under hypnosis, having created hypnotic analgesia and anaesthesia in order to not feel any pain. 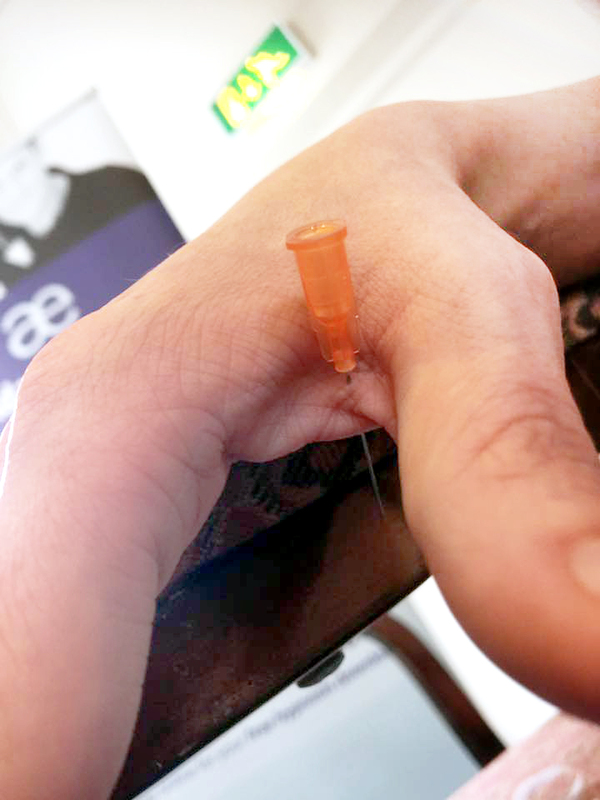 It just shows how powerful the mind is, that you can have a needle pushed through your hand and not feel any pain whatsoever, simply as a result of hypnotic suggestion. People with anxiety often struggle to sleep so this has become another area that I specialise in. I find sleep fascinating. Not the actual act of sleeping (although I love a good sleep), but the mechanisms behind it, what’s happening in the brain and body whilst we’re asleep and the ways that it can become disturbed. No “about me” page is complete without details of my qualifications and what governing bodies I’m a member of. So here it is! I am currently working towards an Advanced Hypnotherapy Diploma. I am dedicated to continual learning and study to further enhance my knowledge and skills and regularly attend seminars, courses and conferences on a wide variety of subjects relating to hypnotherapy. Some of my more recent studies have included insomnia and sleep disorders, immunity and endurance, pain management, professional burnout, self hypnosis, treating intrusive thoughts and inner critical voices, logical and critical thinking, models of change, understanding hypnosis theories and research, rapid inductions and hypnotic phenomenon. I attend both one-to-one and group supervision on a regular basis. I find supervision is invaluable and I have benefited greatly from it. I am a member of the Professional Hypnotherapy Network which strives to ensure that all of its members are kept up to date with the most recent hypnotherapy research through access to the International Journal of Clinical and Experimental Hypnosis. So there we have it, that’s me in a (larger than planned) nutshell. If you would like to work with me, please do get in touch.